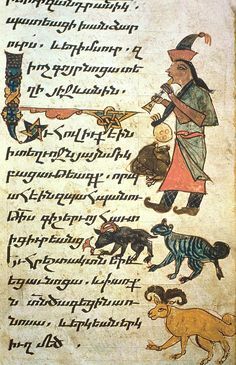 Nakhijevan Gospel (1304): Shepherd Playing the Flute, Armenian. Yerevan: Matenadaran, MS 3722. Ref. Atayan (2016, col.) Illustrates St Luke 2: 8–9. Surrounded by his animals, a shepherd in a pointed hat with a tassel, a purse on a wide scarf hung around his neck, and boots turned up at the points, plays a flared-bell pipe, with a hint of a window/labium, right hand lowermost. An identical illumination appears in the Vaspurakan Gospel (1281), British Library, London, MS Or.2679. Ormesby Psalter (early 14th century): illumination, English. Oxford: Bodleian Library, MS Douce 366. Ref. Galpin (1978: 104–105, fig 26), Thomson (1974: 23, fig. 5); Rowland-Jones (2006c: 3–4 & fig. 1, col.) One of the most magnificent, yet enigmatic, of English fourteenth-century manuscripts, produced in a series of campaigns between ca 1280 and ca 1340, for a succession of different patrons, both lay and monastic. Both the figurative initials and the decoration in this psalter were made in the same workshop (probably in Bury St Edmunds) by two different miniaturists. The codex received its name from Robert Ormesby, a monk who dedicated the codex to the prior of a convent in Norwich. On this crowded page the high quality, irregular frame is remarkable. A larger D and a smaller T initial are related to the text: in the D initial the three temptations of Christ in the desert are depicted. On the lower left-hand side of the highly decorated frame, a cockerel with a man’s body plays a pipe which some (including Galpin, loc. cit.) have taken to represent a recorder. The mouthpiece is not in the player’s mouth, but rests against it, and it does not comprise a reed and pirouette, so a shawm would seem to be out of the question. A mark at the top does look as if it could represent a window/labium, so a duct flute was probably intended. The elbow position is typical of recorder playing, and so are the ‘curved over’ hands. A finger hole is visible between the hands and three further holes are visible below the lower (right) hand. No tuning hole is shown on the bell which one would expect with a shawm. The lowest of the three finger holes is slightly offset to the left and the middle one appears to be double, though this could be an ink-blot or some other artifact. On the right-hand side of the page, immediately opposite the man-cockerel, a horse-headed demon farts in the face of a trumpeter in a sort of competition of wind-instruments! Squatting Man Playing a Pipe (ca 1305), carved misericord. Winchester: Cathedral Church of the Holy Trinity, and of St Peter and St Paul and of St Swithun, North side stalls, 6th from West. Ref. Website: Misericords of the World (2012, col.) Rowland-Jones (pers. comm.) comments that “this is a shawm or cornetto”. However, there is a strong hint of a window-labium so, despite the player’s inflated cheeks, this could represent a duct flute rather than a shawm or cornetto, especially since there is no sign of the reed or pirouette of the former or the cup of the latter. Life of Christ and Life of the Virgin, embroidered cope, silk and gold, with gold groundings on linen, English (1315–1325). Bologna: Museo Civico Medievale. Ref. Linnell (1995); Website (Blog): Needleprint (2014, col.) Amongst the extant English medieval ecclesiastical embroideries, the great copes cover the period from c. 1270 to c. 1330. These large Opus Anglicanum embroideries were made by a number of men working together. In the lower register of the opulent Bologna piviale, each of 13 musical angels plays a musical instrument including citole, fiddle, harp, horns, cymbals, psaltery clappers and bells. The Nativity scene includes a bagpiper on the left and a ‘pipe’ player on the right. Angels in the upper register carry crowns. Gorleston Psalter: Grotesque Playing a Duct Flute (ca 1325). London: British Library, Add 49622. Ref. Cockerell & Perrins (1907); Montagu (1976: 45, pl. 36, b&w); Anthony Rowland-Jones (2006c: 3). An ambiguous pipe, shown by Montagu (loc. cit.) as an example of “a single duct flute, ancestor of the recorder, but too crude to be at all informative”. 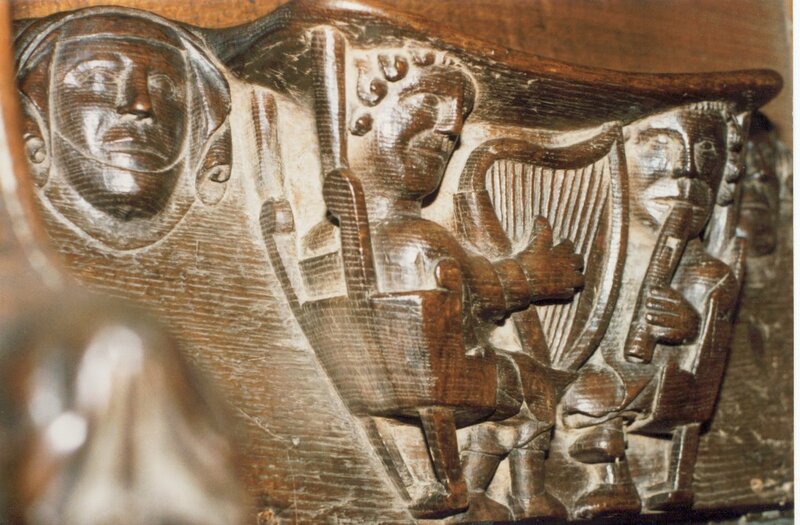 A Harpist and a Piper (ca 1330), carved misericord. Chichester: Cathedral, Precentor’s stall. Ref. Galpin (1978: 105); Thomson (1974: 74 & pl. 2, b&w); Hunt (1977: 9); Hersom (1988); Rowland-Jones (1999c: 33, fig. 9, b&w); Website: The Hurst Misericorde (2011: fiche 457, b&w); Website: Courtauld Institute (2013, b&w); Website: Misericords of the World (2014, col.) Two musicians sitting opposite one another in elegant chairs play alto or tenor size duct flute (possibly a recorder) and harp. The window/labium area of the duct flute is shown with great clarity. The player’s lower (right) hand is broken off, tantalisingly not showing the lower part of the instrument. If this had four fingers down or a hole for the little-finger of the lowermost hand it could be claimed as the first representation of a true recorder. Musical Angels (ca 1342), painted limestone carving, English. Exeter: Cathedral, Musicians’ Gallery, third figure from the right. Ref. Kinsky et al. (1930: 51); Cave (1953: 60); J.B.C. (1957); Peter (1958: 42); Crispin (1968: 358–359); Hunt (1977: 9); Early Music 15 (1): front cover (1987, col.); Website: Courtauld Institue (2013, b&w). On the East side of the gallery, a minstrel plays an ambiguous conical pipe which appears to be a shawm, amongst players of the citole, bagpipe, fiddle, harp, and jew’s harp. On the West side of the gallery are trumpet, portative organ, gittern, pipe, timbrel (with jingle rings) and cymbals. The pipe on the West side has what appears to be a beak (easily visible in the Early Music reproduction (loc. cit.) and may well represent a duct flute, possibly a recorder. 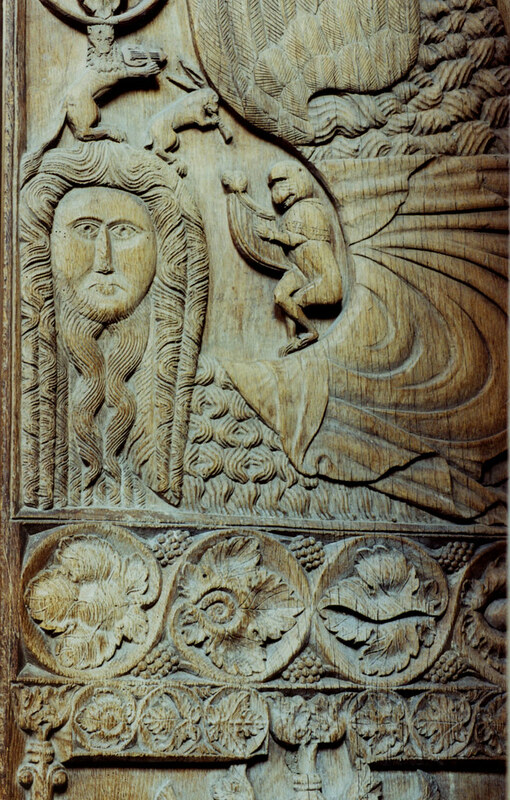 These carvings were restored in 1976. Woodwind Instrument (1385), stained glass, English. Lincoln: Cathedral, Musicians’ Window. Ref. Lincoln Angels Project (2003). “Woodwind instrument, possibly of the duct flute (whistle) family. The damage to the glass has frustratingly destroyed any hope of making a definitive identification. It is possible that the line around the top of the instrument represents the windway [sic.] of the instrument.” (Lincoln Angels Project, loc. cit.) This is highly ambiguous and could just as well represent a reed instrument of some kind. 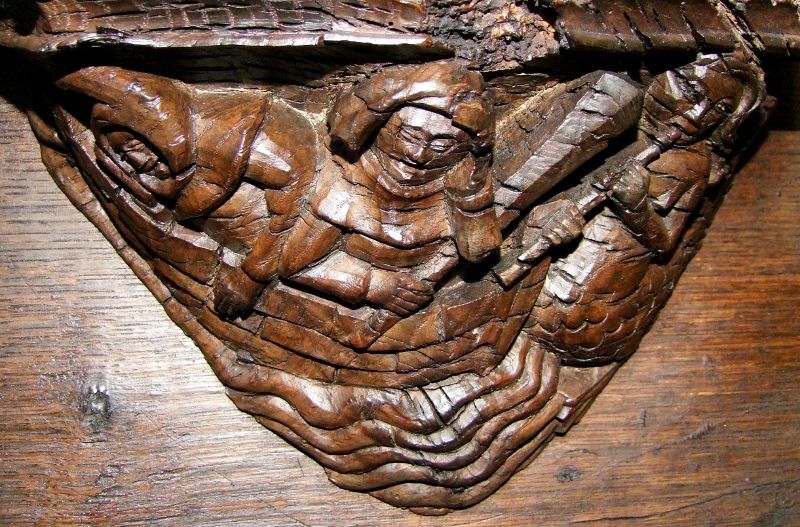 A Fish Siren Luring Seamen in a Passing Boat (ca 1390), wood-carved misericord. Boston, England: St Botolph’s Church, South side, upper stalls, No. 13. Ref. Hunt (1977: 9); Rowland-Jones (1999c: 33, fig. 8, b&w); Website: Musicastallis (2011: fiche 428, col.); Website: Misericords of the World (2014, col.) Two sailors try to stop their ears against the siren’s enticing sounds of a ? recorder. There are no signs of restoration, except recent protective treatment of the wood. The siren’s right wrist and lower hand are missing, and a diagonal crack near the end of the instrument has parted and offset the bell end. The instrument is of tenor recorder size, cylindrical except for an almost imperceptible flare or thickening at the extreme bell end. The mouthpiece seems to be beak-shaped and there is a notch which may represent the window/labium of a duct flute. The siren’s cheeks, which seem neither inflated nor relaxed, are consistent with playing a recorder. Four fingers of both hands are on the instrument, left hand uppermost, yet three holes are visible between the two hands, and three, in line (taking account of the crack in the wood between two lower holes) below the right hand, i.e. six holes visible altogether between and below the fingers. Apollodurus (Epitome 7: 18–19) says that the three sirens played flute and lyre and one sang. 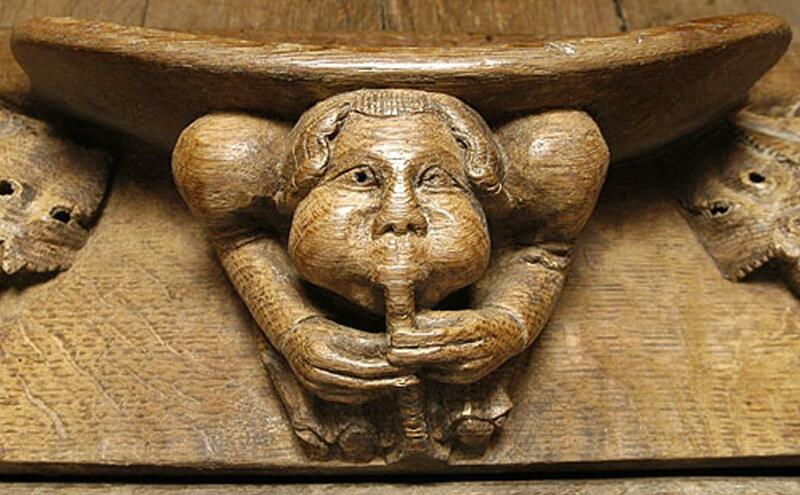 This suggests that the siren in this misericord is playing a duct flute.The peculiar beak of the recorder depicted here is somewhat reminiscent of that of the Göttingen and Esslingen recorders, two of the surviving medieval examples. Angel Playing a Wind Instrument, detail from the crosier of William of Wykeham (ca 1320–1404), silver gilt & champlevé enamel, total height 206 cm English. Oxford: New College, Chapel. Ref. Bridgeman Art Library, NIC205111 (2003, col.); Montagu (2002: fig. 11a–b); CD cover: Evensong at New College Oxford (2004, col.) The crosier is richly decorated with a number of framed images, including musicians playing various musical instruments. In one, a seated man plays a cylindrical pipe with a a slightly flared bell, possibly a duct flute. In another a man plays a similar instrument. These are referred to by Montague as ‘Peter 5’ and ‘Peter 8’. Montagu writes, “There is a trace of what might be a mouth; if so, it indicates that this is a duct flute. I believe that this may be one of the first representations of a recorder” – he suggests the date as 1367 when William of Wykeham was consecrated as Bishop of Winchester. He continues, however, “One can seldom be certain …” He conjectures, but with even more uncertainty, that ‘Peter 8’ (fig.11b) might depict a shawm, but the outline of thickening at the bell-end, to protect against cracking and perhaps to facilitate bore reaming, could just possibly suggest that this is another recorder; some instruments are repeated on the crosier and, with its symbolism of the cult of the Virgin Mary, all the instruments except for some light percussion are bas rather than haut. But neither ‘Peter 5’ nor ‘Peter 8’ shows a clear window/labium, and the lower hand in each case is too high up the instrument for recorder playing. Bust of a Piper (14–15th century), red, dark green-glazed pottery, English. Cambridge: Museum of Archaeology and Anthropology, Inv. Z 15378. Ref. Rackham (1972: 10, 19 & pl. 15, b&w); Charles Rowland-Jones (pers. comm., 2007). An object of uncertain purpose with a horizontal opening right through it. 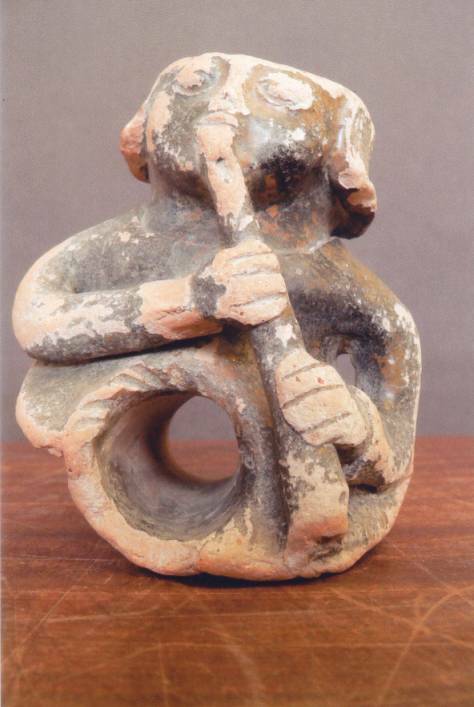 A pot in the form of a man playing a narrowly conical duct flute, possibly a recorder. The beak and window/labium of the instrument are clearly depicted, and all the player’s fingers seem to be in use. There is a single hole open right near the bell. Bear Playing a Recorder (14–15th century), carved wooden bench end, England. Wiggenhall: St Germans Chuch. A bear (or monkey, perhaps) plays a recorder, the window/labium and doubled holes for the little finger of the lowermost hand clearly depicted. Interestingly, the head of this instrument is bent in a manner reminiscent of modern ‘knick-system’ instruments. The medieval benches in this church form the two central ranges in the nave. They include representations of the Seven Deadly Sins, the seven sacraments of the Catholic Church, the Evangelists, and a small selection of carved animals. Most of the latter are quiet, local images of everyday creatures, although there is a super pig-like dragon, and this musical beast. Man Playing a Pipe (?14th century), carved stone corbel, England. Anwick: St Edith’s Church, external wall. The church building dates from the late 13th century and was restored by local builder/architect/mason Charles Kirk of Sleaford in 1859. Several carved musicians adorn the walls of this church. One is playing a small conical pipe, possibly a duct flute. Another is playing a longer pipe with a strongly flared bell, probably a shawm. From Augustine: De civitate Dei (French): Coronation of the Virgin (14th century), ? Flemish. Paris: Bibliothèque Nationale 9006, fol. 293. Ref. Hottoit (1982); Rowland-Jones (pers. comm, 2001; 2006c: 6). Around the coronation scene, nine angel musicians of which two, at the top left and at the centre, are playing wind instruments not identified by Hottoit (loc. cit.) Both play with their right hand lowermost. The alto-sized instrument on the left, however, may be a recorder as it appears to have paired little finger holes and a slightly flared bell, and possibly a window/labium, though the latter is very indistinct. The instrument on the right is of soprano/alto size. Untitled drawing (14th century), Flemish. Brussels: Koninklijke Bibliotheek van België, MS Folio 39. Ref. Wright (1977, fig. ); Website: The Citole Project (2001); Rowland-Jones (2006: 9 & fig. 7, b&w). 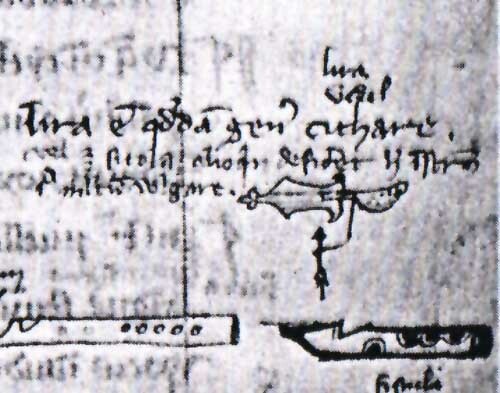 Beneath a drawing of a citole with a holly-leafed shaped body ending in a trefoil are simple drawings of two duct flutes, marked ‘fistuli floyt’. That on the left (possibly a recorder) has a clearly depicted window/labium and seven finger holes more or less clearly marked, although the upper two are somewhat apart from and fainter than the lower ones, and the curve on the beak is cut the wrong way around. That on the right (probably a tabor pipe) has a clearly depicted window/labium, three finger holes on the upper surface, a thumb hole beneath, and a correctly configured beak. From Augustine: De civitate Dei (French), illumination, 9.0 × 8.5 cm, adapted by Raoul de Presles (ca 1390), Flemish. Paris: Bibliothèque Nationale 9294, fol. 38r ex Saint Laurence Abbey, Liège. Ref. Hottois (1982: pl. 37, cat. 78); Rowland-Jones (2006: 5-6). Five musicians play for 12 listening bearded Romans. From left to right the first musician plays a fiddle, the second a rebec, the third a duct flute (the window of which can be discerned), the fourth a shawm, and the fifth the bagpipes. 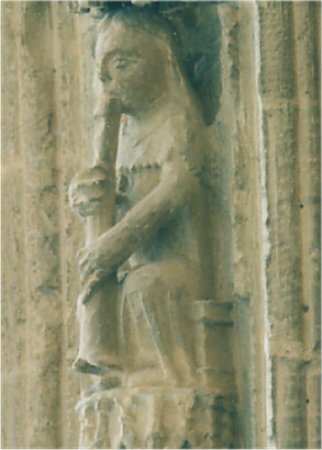 Musician with a Flageolet (14th century), stone sculpture, 18.5 × 14.0 × 21.0 cm, Flemish. Nivelles: Musée Communal. Ref. Institute Royal du Patrimonie Artistique / Koninklijk Instituut voor hef Kunstpatrimonium (IRPA/KIK), Brussels (2007). A musician plays a pipe with a flared bell. It could represent a shawm or duct flute, even a recorder. Altarpiece (14th century), alabaster, possibly Flemish. Detail. El Paular: Monasterio de Santa María, Church. Ref. Centre for Music Documentation (CMD), Madrid (2001); Charles Rowland-Jones (pers. comm., 2001). The Monastery at El Paular was founded in 1390 in the reign of Juan I. The church was rebuilt in the 18th century after an earthquake in 1755. 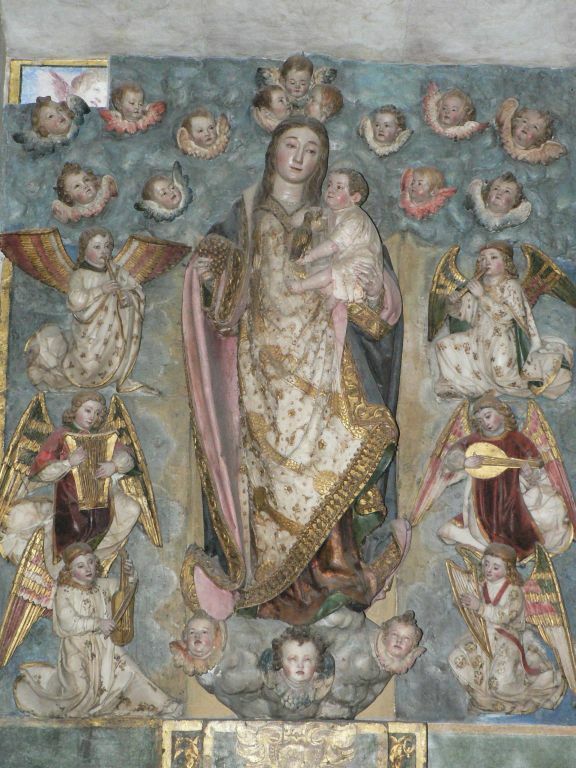 The vast altarpiece illustrating the lives of the Virgin and Christ has also been attributed to the school of Juan Guás. It includes many angel musicians in different scenes. There are three pipe-playing angels depicted in the altarpiece itself: two in the bottom left-hand panel, and one in another panel at the bottom close to the centre, but only one of these seems to be a recorder, namely that in the bottom left-hand panel in which the other angels surrounding the virgin and child are playing a small shawm, psaltery, lute, fiddle, and harp. Bel and the Dragon (14th century), stained glass (French). Mulhouse: Temple Saint-Étienne. Ref. Grodecki (1948). The narrative of Bel and the Dragon combines three stories that ridicule the worship of idols. Two of these narratives are illustrated in this glass. In the story of Bel the king asks Daniel, “Thinkest thou not that Bel is a living god? seest thou not how much he eateth and drinketh every day?” to which Daniel answers that the idol is made of clay covered by bronze and thus cannot eat or drink. Enraged, the king then demands that the 70 priests of Bel show him who consumes the offerings made to the idol. The priests then challenge the king to set the offerings as usual (which were “twelve great measures of fine flour, and forty sheep, and six vessels of wine”) and then seal the entrance to the temple with his ring: if Bel does not consume the offerings, the priests are to be sentenced to death; otherwise, Daniel is to be killed. Daniel then uncovers the ruse (by scattering ashes over the floor of the temple in the presence of the king after the priests have left) and shows that the “sacred” meal of Bel is actually consumed at night by the priests and their wives and children, who enter through a secret door when the temple’s doors are sealed. The next morning, Daniel calls attention to the footprints on the temple floor; the priests of Bel are then arrested and, confessing their deed, reveal the secret passage that they used to sneak inside the temple. They, their wives and children are put to death, and Daniel is permitted to destroy the idol of Bel and the temple.In the story of the Dragon, Daniel declares that “without sword or staff” he will kill the dragon worshiped by the Babylonians To do this, he makes cakes from a mixture of pitch, fat and hair which sound disgusting, but when he offers them to the dragon, it eats them. The cakes ignite inside the dragon (presumably by the fire that dragons breathe) and the dragon expires. The remaining story is the familiar one of Daniel and the Lion. Convinced by these demonstrations, Cyrus converts to Daniel’s Jewish faith. 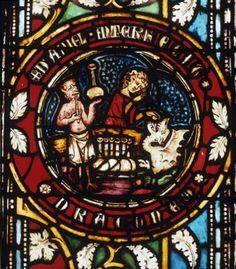 In this stained glass, as Daniel feeds his cakes to the dragon, Bel (depicted as a bird-footed devil) holds up one of a several bottles filled with wine In his right hand he holds what could be a pipe of some kind, possibly a duct flute – or is it simply a drinking straw? Sirens, painting in the former tower in the bishopric of Beauvais, French. Ref. Unknown, Fig. 10 (b&w sketch). Five sirens play musical instruments, namely bagpipe, pipe and frame drum, elongate triangular lute or monochord, vielle, and a slender slightly conical pipe. Bucoliques of Virgil (1300): untitled miniature, French. Lyon. Bibliothèque de l’Académie, MS 27. Ref. Ref. Michel et al. (1958, 2); Angelo Zaniol ex Anthony Rowland-Jones (pers. comm., 2000). A rustic scene in which three shepherds amuse themselves in a meadow. One plays the bagpipes, another a duct flute (flageolet or recorder). A third, leaning on his staff, may be singing. A cow wanders about in the background. Angel Musicians (late 14th century), frescoes, French. Lavardin: Église St Genest, murals on south chancel wall above scenes form the Passion. Ref. Postcard: Compier Imprimeur Macon Cimy (col.) A choir of angel musicians of which seven are clear enough to distinguish the instruments, namely a harp, double flute of considerable length with a wide bell flare, psaltery, bagpipe, triangle and a possible recorder. The window/labium of the latter is quite clear; the upper right hand is just taken off the instrument; the lower left hand has all four fingers on and partly across the instrument. The instrument is cylindrical but its bell end is blurred. It is just possible that this could represent a second double flute. 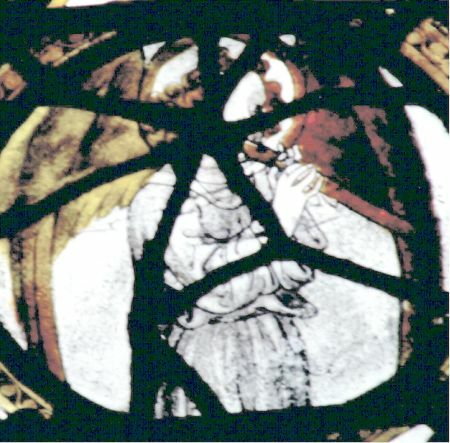 The attitude of the angels suggests late 14th or early 15th century, due to the curved stance. There is a trapezoid fiddle and a lute on the north side of the chancel. Notes from Anthony Rowland-Jones (pers. comm., 2000). Grandes Chroniques de France, Paris (1338–1380–1461): Festin à l’occasion de l’institution de l’Ordre de l’Etoile, illumination, 17.5 × 14.5 cm; 9 .0 × 14.5 cm, French. Paris: Bibliothèque Nationale, FR 2813, fol. 394. Ref. 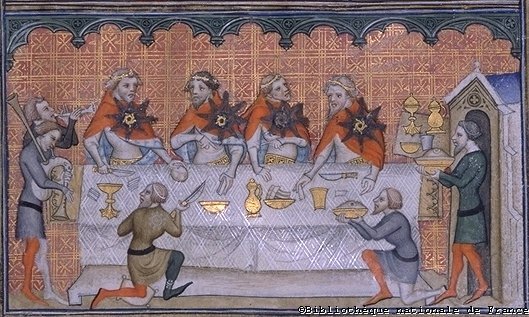 Le roi Charles V et son temps … (2002, col.) At a long table, four kings each wearing a huge star-shaped medal are served food and drink to an accompaniment provided by a bagpiper and a piper. The latter’s instrument is short with a flared bell and may represent a duct flute rather than a shawm. Histoire de la Bible [Story of the Bible]: Samuel Speaks to David (1390–1400), manuscript, 35.5 × 26 cm, French. New York: Pierpont Morgan Library, M.526, fol. 19v. Ref. Ford (1988: #196); Rowland-Jones (2006c: 7 & fig. 6, b&w). “Upper: Samuel, tapping his right index finger on his left palm, speaks to David, who carries a recorder, a harp and a hurdy-gurdy. Lower: David, seated, plays the harp before Saul” (Ford 1988, loc cit.) The window/labium and six finger holes of the recorder are clearly depicted, and a hole for the second finger of the upper-most hand is obviously hidden beneath the owner’s hand; it has a flared bell. This would be a perfect image of a recorder if it were known whether or not it has a thumb hole. It could be a seven-holed ‘intermediate’ duct flute, although the artist might have wanted as famous a musician as David to hold a fully developed chromatic recorder (with a thumb hole). Angel Musician (1390–1400), stained glass medallion, French. Evreux: Cathedral de Notre-Dame, Rosary Chapel in the north ambulatory, upper section of the left-hand lancet of the central bay, numbered 17. Ref. Rowland-Jones (2006c: 10 & fig. 9, col.; 2006a: 15, front cover, col. & figs 1–2, b&w). Medallion of an angel-musician playing a duct flute (probably a recorder). Within the period 1390–1398, ‘royal windows’, donated by Charles VI and Pierre de Navarre, were being installed in the choir. They were made in a Parisian workshop where the draughtsmanship was influenced by the book-illumination workshop founded by Jean Pucelle, famed for his Hours of Jeanne d’Evreux, wife of a former King of France, Charles IV. Stylistic comparison also suggests that the Rosary windows came from the same royal source. Both in Evreux and Bourges the presence of possible recorders could therefore be associated with music-making in royal courts. The Rosary windows, especially the angel-musician medallions, were restored in a sort of Pre-Raphaelite style in 1893 by E. Didron. He replaced about half the medallions with single, unleaded panes, but the colouring is paler and the style shows Pre-Raphaelite influence. The angel depicted in this medallion seems to have escaped his zeal, as Didron would surely have given him back his missing right eye. It is noteworthy that the artist has shown the whole instrument on one piece of glass, and that, being an unfamiliar instrument, it is turned slightly towards the viewer. The angel’s hands are moved up into a position to cover only one, or perhaps two, upper finger holes. This clearly reveals two further finger holes, and there are possibly four more further down, although unfortunately they are blurred and rather conjectural. The actual total number of finger holes, obviously more than six, could have been a subject of uncertainty for the artist himself. Thus this is a probable, or even a likely recorder, especially as its dating is similar to the unambiguous contemporaneous Aragonese representations. Casanatense Missal: Majestas (ca 1390–1408), illumination, French. Windsor Castle: Royal Collection, MS 25010, Folio 198v. Ref. Exhibited Museum Het Valkhof, Nijmegen: The Limburg Brothers: Nijmegen Masters at the French Court (1400–1416) (2005); Arnold den Teuling (pers. comm., 2005); Rowland-Jones (2006a: 16–17 & figs. 3–4, b&w); Museum Boijmans van Beuningen, The Road to Van Eyck (13 October 2012—13 January 2013); Jan Bouterse (pers. comm., 2012); Website: Royal Collection Trust, RL 25010 (2013, col.) One of two sheets separated from a missal with music, now in the Biblioteca Casanatense, Rome. The illustrator is thought to have been an unknown miniaturist from the Duchy of Guelders, of which Nijmegen was the capital. The missal originally belonged to Jean d’Armagnac, archbishop of Nemours and great-grandson of Jean, Duke of Berry. One of the Windsor sheets is a Majestas Domini (Christ enthroned, wearing a three-tiered crown – in effect a papal tiara – and surrounded by a mandorla made up of red seraphim, with depictions of the four Evangelists) borderd by 16 musical angels. The second angel down on the right plays what is almost certainly a recorder of soprano/alto size. The thumb of the uppermost (right) hand is outstretched beneath the instrument and the fingers are curled over with the wrists low to facilitate control of the thumb hole. All fingers are down but, presumably deliberately, are shown bunched up in order to reveal the finger holes nearest the foot of the instrument – of which two are clear, not in line – and possibly a third. The the apparent absence of sidewalls to the cut-up reminds us of the Virgin of the Angels by Enrique de Estencop (fl. 1387–1400), from the church of Longares, near Zaragoza. Other instruments which appear in this illumination are three shawms, oval fiddle, two gitterns (each with a sickle-shaped pegbox), two small lutes (each with a reflexed pegbox), a rebec, two psalteries (one porcine, one trapezoid), bagpipe, harp, hurdy-gurdy, cupped cymbals, pipe and tabor, and triangle (with jingle-rings), all accurately represented. If before 1400, this representation would be as significant as the Catalan and Evreux images but, after 1400, accurate depictions become more frequent. Musicians (late 14th century), eight enameled miniatures mounted on a pulpit or fountain (table centerpiece), silver gilt and translucent enamel, 31.1 × 24.1 cm, French. Cleveland: Museum of Art, 24.859. Ref. Ford (1991: #36); Anthony Rowland-Jones (pers. comm., 2005; 2006c: 12–13 & fig. 12, b&w). Five of the eight miniatures contain musical figures. In one of them a woman at the left plays a portative organ with a rank of eight protruding pipes, using her left hand for the melody and her right to pump the bellows (this instrument has also been identified as a psaltery). At the right an oldish man with a splendid beard plays an alto/tenor sized duct flute (the window/labium clearly visible). Both players sit on decorated bench-chairs. The images gives the impression of upper-class domestic music-making. The man has all fingers and both hands down, except possibly the first of the lower (right) hand. the instrument is outwardly conical, with some bell flare. The bore opening is wider than the mouthpiece at the player’s lips. The hands are shown too sideways-on for the upper thumb to reach a thumb hole under the instrument, but this may be an effect of the medium. This image gives the impression of informal upper-class domestic music-making. Tomb (14th century), carved stone, French. Avignon: Palais des Papes, Chapel. Ref. Anthony Rowland-Jones (pers. comm., 2007). A tomb apparently brought from the magnificent monastery church of Chaise-Die in the Auvergne. The occupant is one Renaud de Monclare. The stone carving is exquisite. Within a wide arch across the tomb, and well frontward, is an open-work screen which incorporates medallions, each with an angel instrumentalist. One of the ten is too damaged to identify, but others play bagpipes, lute, tambourine, cornetto, portative organ, vielle, psaltery played with a plectrum, and a tabor with a beater. The second down at upper right holds a beaked duct flute with a long window/labium. It is of alto/tenor size, cylindrical with a wide bore. Unfortunately, no finger holes are visible. It could be a flageolet or recorder. Misericord (14th century), wood carving, France. Lautenbach (Alsace): Église St-Martin. A man with huge ears holds a twisted stick with one hand and a duct flute with the other. The window/labium of the duct flute is clearly depicted but there seems to be finger holes for only one hand. The church dates from the 12th century. Annunciation to the Shepherds (?15th century), illumination, ? France. Location unknown. Ref. Website: gallica (2011, b&w) From a book of songs. In the hills above a city, shepherds point to the heavens as angels make their announcement. One shepherd sits holding a tenor-sized conical pipe with a strongly flared bell. There is the hint of a beak so this may represent a duct flute of some kind. The sheep and a dog seem oblivious to the fuss. Grotesque Playing a Flute, with Drums (ca 1310), carved wooden medallion on choir stall, German. Köln: Dom. Ref. Archiv Moeck; Website: Iconographie musicale dans les stalles médiévales (2010: Scene No. 549). An ape-like grotesque plays a cylindrical pipe with both hands, right hand uppermost. There is what appears to be a large drum in his lap and a small tabor near his shoulder. Flute-playing Demon (1376/1400), stone-carved corbel, German. Erfurt: Dom St Marien. Ref. Website: Bildarchiv Foto Marburg (2002: DISKUS-Objekt-Dokument 20224491, b&w). At the base of a corbel supporting three pillars, a demon with outstretched wings plays a vertical cylindrical pipe with a flared bell, possibly a recorder. Diptych: Nativity and Annunciation to the Shepherds and Presentation in the Temple (late 14th century), ivory with silver hinges, each panel 64 × 54 mm, German (Rhineland). Darmstadt: Hessisches Landesmuseum, Inv. Pl 36:103. Ref. Website: Courtauld Institute (2012, col.) The left wing depicts an Annunciation to the Shepherds in which an angel holds a scroll and two shepherds hold a bagpipe and a duct flute with a flared bell (possibly a recorder) the beak and window-labium of which are clearly visible. The duct flute player holds his instrument with all fingers covering their holes, except for the little finger of the upper (left) hand. Beneath the musicians lies Mary, with a sour look on her face, playing with the Child. Joseph sits at the foot of her bed. The Birth of Christ (14th century), mural, Anonymous, Greek. Mystras: Peribleptos Monastery, South aisle. Ref. Rowland-Jones (pers. comm., 2000; 2006c: 13). All murals in Mystras were restored in the 1950s and again in the 1980s. A shepherd plays a flared-bell pipe which appears to have two offset holes for the lowermost little finger, although there is no sign of a window/labium. Notes by Anthony Rowland-Jones (pers. comm., 2000). There is a striking resemblance between this shepherd, one dated 1430 from the Pantanessa Monastery, Mystras, and a late 16th-century one from Mt Athos (see below). Casket, walnut with a carved ivory lid, ?Italy, late 14C. Vic: Museu Episcopal ?4959. Ref. Website, flickr: Wilfried Praet’s photostream (2016, col.) The surface of the lid comprises six panels depicting a man with a hawk, a peacock, a woman with a fan, a woman playing a harp, a zoomorphic fountain, and a man playing a more or less cylindrical duct flute. The latter is seen in side profile, the characteristic beak clearly depicted and just the hint of a window/labium. Three fingers of the piper’s uppermost (right) hand and all four fingers of his lower hand seem to be covering their holes, so this may represent a recorder. Assumption of the Virgin (ca 1340), wood panel, 72.5 × 32.5 cm, by an anonymous Siennese artist at Avignon, previously attributed to Lippo Memmi (fl. 1317–1357). Munich: Alte Pinakothek. Ref. Munich: Alte Pinakothek, Inv. WAF 671. Ref. Os (1969); Brown (1995: 2, fig. 1); Munich RIdIM (2013: Mstag – 836, b&w). There are striking similarities between this painting and a number of other Siennese paintings with circles of musical angels, including the Master of the Ovile Madonna’s Assumption at Sienna (1365), and another Anonymous Sienese Assumption in Berlin (dated early 15th or perhaps late 14th century). Here, the Virgin ascends to Heaven on a cloud surrounded by angel musicians singing and playing straight trumpets, pipe and tabor, nakers, lute, double pipe, fiddle, organetto, shawm, and an ambiguous pipe which may be a flageolet or a recorder (no finger holes are visible). 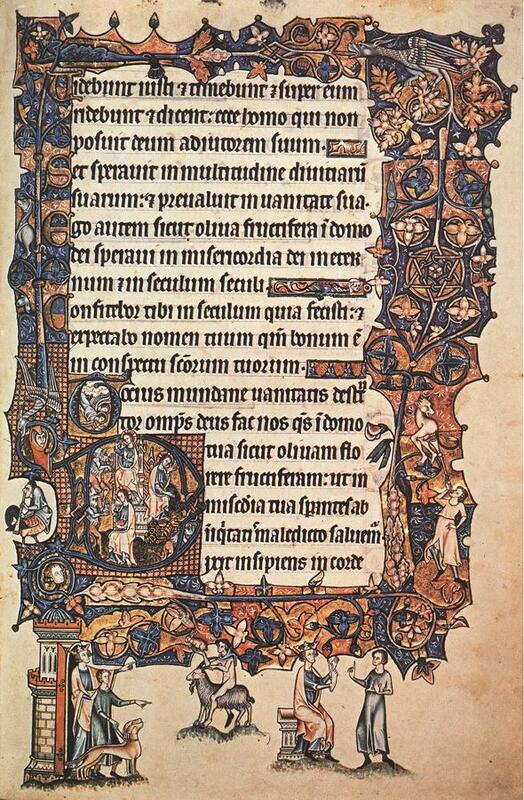 Bible of Anjou: Prologue and First Letter of Peter (1340), illumination on vellum, Italian. Leuven: Katholieke Universiteit, Maurits Sabbe Library, Anjou_306r. Ref. Hove (2010); Websitez; Illuminare (2010, col.). The initial P (Petrus apostolus Iesu) portrays Peter in conversation with other Apostles, recognizable by their nimbuses. The margins of the page are adorned with delicate figures and decorations. At the bottom of this page are two musicians, one playing a gittern, a lion at his feet; the other (on horseback), playing a small flared pipe (possibly a duct flute), the finger holes clearly visible, but no other details. They are attacked by an archer, an angel brandishing a sword, a man on horseback wielding a sword in one hand and a straight trumpet in the other, and a cross-bowman. On the far left-hand side a man struggles with the tendrils of an aggressive-looking plant. This manuscript originated at the court of Robert I of Anjou, King of Naples. It was intended as a wedding present from Robert to his heir-apparent Andreas, who was murdered before he was crowned. The illustrations are the work of a number of Neapolitan artists. Many other musical instruments appear in this bible, amongst them bagpipes, trumpets, horns, gitterns, lutes, shawms, psalteries, tabors, fiddles. Bible of Anjou: Prologue to the Book of Judith (1340), illumination on vellum, Italian. Leuven: Katholieke Universiteit: Theology Faculty, Maurits Sabbe Library, Anjou_122v. Ref. Hove (2010); Illuminare (2010, col.) The page margins are adorned with delicate figures and decorations. 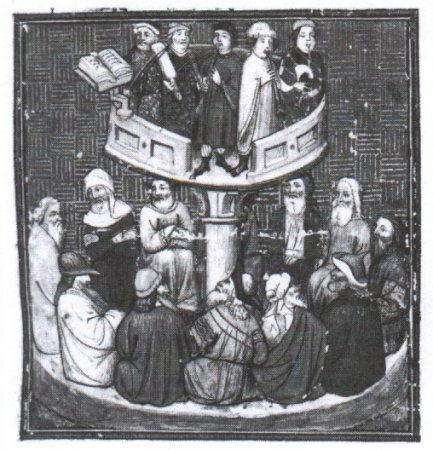 In the centre top a standing man holds a curved pipe which might just be a recorder. Four holes are visible beneath the player’s hands and the lowermost hole appears to be doubled, a distinguishing feature of recorders. It’s similarity with the instrument depicted at Anjou_122v is striking. At the bottom centre of the page a naked man rides on a goat, his hands holding up a small initial letter A (APUD Hebraeos liber Iudith) portraying the bishop Jerome enthroned. The top of the pages is titled TOBIE. This manuscript originated at the court of Robert I of Anjou, King of Naples. It was intended as a wedding present from Robert to his heir-apparent Andreas, who was murdered before he was crowned. The illustrations are the work of a number of Neapolitan artists. Many other musical instruments appear in this bible, amongst them bagpipes, trumpets, horns, gitterns, lutes, shawms, psalteries, tabors, fiddles. Bible of Anjou (134o): Prologue to the Book of Nehemia, illumination on vellum, Italian. Leuven: Katholieke Universiteit: Theology Faculty, Maurits Sabbe Library, Anjou_113v. Ref. Hove (2010); Illuminare (2010, col.) The page margins are adorned with delicate figures and decorations. On the left-hand side beneath a head representing the wind, a man holds a curved pipe which appears to be a recorder. The window/labium is clearly depicted, and a number of holes are visible beneath the player’s hands. It’s similarity with the instrument depicted at Anjou_122v is striking. Beneath him, winged angels play straight trumpet and fiddle, and another man plays gittern. The top of the folio is titled IEREMIAS. The initial letter ‘V (Verba Neemiae filii Echliae) probably depicts Nehemiah Hanaani in discussion with his brother in the city of Susa who was amongst the Jews who survived the exile from Jerusalem. Thirty Bible Episodes (mid-14th century): Coronation of the Virgin, tempera on wood, Venetian. Verona: Museo di Castelvecchio. Ref. St Giorgio (exhibition of recently restored paintings from Venice and region); Anthony Rowland-Jones (pers. comm., 2000). Christ and the Virgin are seated side by side with two angels on each side, one on each side playing an instrument. The angel on the left plays a psaltery; that on the right a slender cylindrical pipe of soprano/alto size (probably a duct flute as the cheeks and lips seem relaxed), the left hand lowermost, no finger holes visible. Angel Orchestra (c. 1360), carved ceiling stone bosses. Gloucester: Cathedral, Presbytery Vault, above the Great East Window. Ref. Anthony Rowland-Jones (2009). One angel musician has a double tabor pipe; another puffs at a slightly curved pipe, probably a smallish shawm or early cornetto. And one plays a soprano duct flute (flageol or recorder) which has a window/labium. The player’s lower (left) hand is drawn slightly away from the instrument and from the floor one cannot see any finger holes. Prensner dates completion of the vault as c. 1360. The vault was completed c. 1360 but repainted by Clayton & Bell between 1870 and 1895, presumably after some restoration of the stonework. If this is a recorder than it is amongst its very earliest representations. Tacuinum Sanitatis, Fol. 71r (late 14th century): Castrated Animals, illumination on vellum, Italian School. Vienna: Osterreichische Nationalbibliothek. Ref. Bridgeman Art Library (2003: Image ALI142970, col.) Surrounded by their presumably castrated animals (a bullock, goats, sheep, hogs), two shepherds sit on a wall, one playing a pipe with a conspicuously flared bell. However, there is a hint of a window/labium, and the lowermost finger hole is visible and clearly offset, suggesting that this might be a recorder, though it might just as well represent a shawm. Tacuinum Sanitatis is the modern title given to one of the most popular treatises on medicine during the later Middle Ages. It combines Arabic and western knowledge on many types of foods, plants, and circumstances, with particular reference to their useful and harmful properties, and how the latter could be cured if necessary. The illustrated versions of this text, of which two are presented here, yield much information on medieval daily life. Stone carving (ca 1350), Spanish. Betanzos: Iglesia de Santa María del Azogue, West front portal, projecting central bay. Ref. Centre for Music Documentation (CMD), Madrid (2001); Anthony Rowland-Jones (pers. comm., 2001). An angel plays a very fat pipe of some sort, but not enough detail to identify; no window/labium or finger holes. The instrument is very wide at the lips of the player and so fat that his hands each only get half-way around, just reaching where the holes would be. This carving is in Romanesque style, which persisted in remoter parts of Spain into the 14th century. Chain Portal: Angel Musician (? late 14th century), stone carving, Spanish. Orihuela: Catedral El Salvadori, South Portal. Ref.Centre for Music Documentation (CMD), Madrid (2001); Anthony Rowland-Jones (pers. comm., 2001). “From the finial of the central ogee arch an angel plays a wide alto/tenor size duct flute with relaxed lips and, despite some wear, a clear window/labium. The player’s left hand is upper-most, with all fingers on (but this angel has only three fingers). Also, all fingers of the right hand are down with the little finger at the side possibly covering a hole. There is a medium bell flare showing wide expansion of bore” (Rowland-Jones, loc. cit.) Other angel musicians play rebec, psaltery, fiddle, etc. No archival documentation which might provide a more exact dating is extant for that period, when the region was much disturbed by warfare. Animal Musicians (1370s), carved wood, Swedish. Detail. Lund: Domkyrka, stalls. The cathedral is Romanesque. The one of the Gothic choir stalls carved in 1370s which depict Old Testament scenes includes a lion playing a rebec, a hare playing a pipe, and a grotesque playing a harp. The pipe is very slightly tapered. Untitled woodcut (?14th century), provenance unknown. Ref. Girolamo Frescobaldi (ed. Colin Stern), Canzona for soprano or tenor recorder & basso continuo, American Recorder Society/Galliard, London (front cover). Seated under trees, two shepherds face each other. The shepherd on the left holds a crook in his left hand and a flared bell recorder in his right. His companion points with his right finger and holds a similar recorder in his left hand. Both instruments have paired holes for the lowermost finger clearly shown. This may be mock-medieval, of course.